We arrived in the desert around 6 pm. We wanted to set our camp before exploring the area but the wind was not on our side. We were struggling to fix our tents when a 10 years old boy and his father came to us. They advised us to stop fighting with the wind as it was going to stop blowing around 8 pm. They were a omanese family camping not far from our spot during their Eid holidays. They knew the desert better than us. 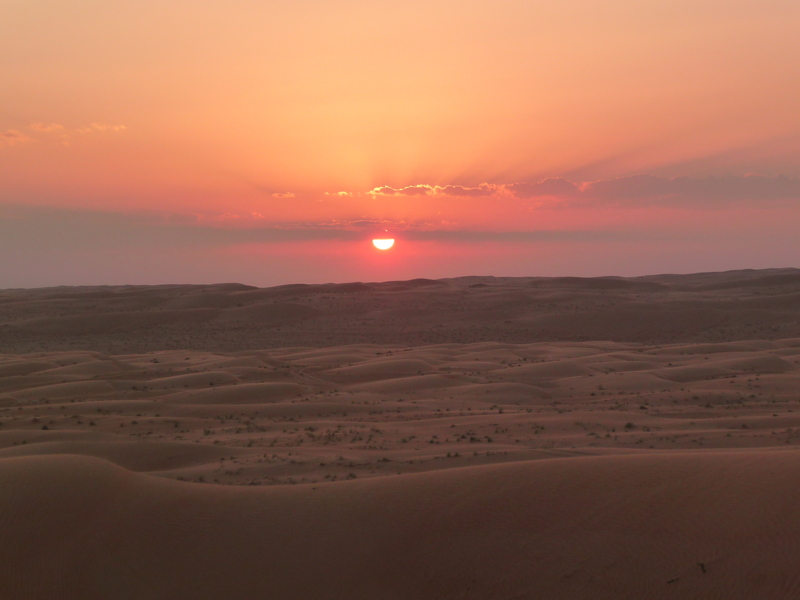 We thanked them and we decided to set the camp after a walking tour in the desert to enjoy the sunset. We climbed dunes, we took very artistic pictures of the 6 of us, we run down the dunes like kids feeling as we could fly over the desert. One of us also experienced the fall from the sky to the sand and he arrived at the feet of the dune safe but covered in sand. 8pm and no wind. Back to our 4WD, we started setting the camp again. After fixing the tents very easily, we began attempting to turn our poor camping food into a decent meal. At that moment our 10 years old friend arrived and invited us to join him and his family to dinner. We took our poor food to share it with them and we followed him to their holiday camp in the desert. The camp was warm, welcoming and with no roofs hiding the stars. We met the other family members and the chef in his open-air kitchen: he was preparing for us a goat! We immediately understood that our poor dinner was turning into a 5 stars experience. We spend the night talking about our cultures, sharing experiences, food and laughs. We felt at home. The next day we went together to visit the Bedouin village that provided our dinner. We shared dates with tea with them and of course we met some of their goats. After another ride surfing the dunes with our cars and 2 quads, we said goodbye to our friends and we headed out of the desert to continue our journey. Once we were on the road again, we took off the sand from our shoes and we washed out our car but we brought home specks of sand of the Wahiba desert. They are still in our hearts.